Helping you pay for the cost of routine healthcare such as dental check-ups, new glasses or contact lenses, physiotherapy and other treatments. Put simply, the Health Cash Plan is an easy, low-cost way to look after your essential medical requirements, including up to 100% of your money back on dental and optical cover (up to a maximum of £150 benefit each per year). The plan also covers therapy treatments and you'll get money back towards prescription charges and specialist consultation fees. 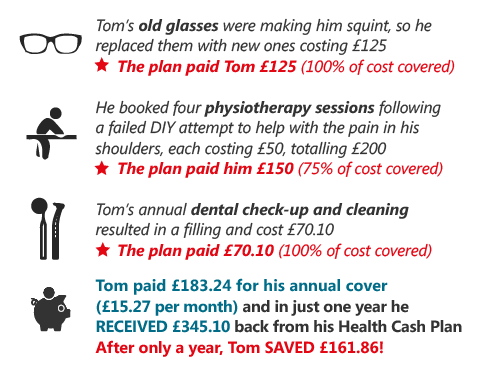 With cover starting from £15.27 per month, just a couple of treatments a year is often all it takes to see the plan pay its way. Claiming your cashback on the plan couldn't be simpler - you pay the bill upfront, then send your receipt and claim form to Compass Underwriting Limited - they aim to pay your claim within 5 working days of approval. • Cover for accidents is instant. It isn't private medical insurance, but what it will do, is give you cash to cover more routine services, such as a visit to the optician, a dental filling or physio for a sore shoulder. It even includes cover for hospital car parking costs and will pay out £200 for a new baby, £900 if it's twins (a 300 day qualifying period applies). Rather than relying on savings or a credit card, the health cash plan enables you to claim back some or all of the expense....because those expenses do add up! And it's not only financial benefits offered by your plan. There's access to a 24-hour helpline and counselling service for added peace of mind. Below are the benefits covered by the Health Cash Plan. For full details of benefits, qualifying periods and maximum annual benefits, please read the Policy Wording. £65 per night for up to 20 days. £45 per day for parking. £25 per day / night for up to 20 days. £10 per day for parking. You cannot claim for any benefit within the relevant qualifying period e.g. 60 days for optical and dental, 90 days for therapy treatments. You will not be paid for more than one benefit for the same treatment or hospital stay. Pre-existing conditions are covered following these qualification periods. Full details of this cover, and any exclusions that apply, are included in the 'What is not covered' section of the Policy Wording. This Health Cash Plan is designed to meet the needs of those who wish to have financial help covering the costs of dental or optical expenses, such as check-ups and new prescription glasses and for other routine medical expenses. "As I wear glasses and have a dental check-up every 6 months, the plan has more than paid for itself. Add in couple of other routine health expenses during the year, I was able to claim over £340 – that’s £150 more back than I paid for the plan. So I’ll be keeping mine…"
What's a Health Cash Plan? A health cash plan is an easy, low-cost way to look after your basic healthcare costs, including dental check-ups, eyesight tests, therapy treatments and even hospital car parking. You pay the bill upfront and then claim back the costs. The amounts you can claim depend on the benefit type and this can be found in the table of benefits. Is it the same as private medical insurance? No, this isn't private medical insurance. A health cash plan provides cash benefits for routine healthcare costs e.g. dental treatments, prescription glasses, prescription costs and therapies such as physio and osteopathy. You can be covered provided you are aged 18-65 and a UK resident. Plus, there are no medical questions to answer - acceptance is guaranteed - and your policy can continue until your 75th birthday as long as you pay the monthly premium. Some benefits have a qualifying period of between 30 to 120 days before you are entitled to claim, however following this period all pre-existing medical conditions will be covered. For details regarding the qualification periods, please see the table of benefits. Cover is only available to residents of England, Scotland, Northern Ireland and Wales. Below are just some of the benefits covered by the Health Cash Plan. For a full list of benefits, qualifying periods and maximum annual benefits, please read the Policy Wording. You cannot claim for a benefit within the qualification period for that benefit. You will not be paid for more than one benefit for the same treatment or hospital stay. You cannot claim for treatment required as the result of certain events which are listed as excluded on your policy. Click here to see the full list in the Policy Wording. Are there any waiting periods before benefits can be claimed? Some benefits have a waiting period (qualifying period) of between 30 to 120 days before you are entitled to claim. This limitation does not apply if the claim is as the result of an accident for ‘dental’, ‘hospital in-patient’, ‘day patient treatment’ or ‘parental hospital stay’ or using the help lines, which are covered immediately as long as your first premium has been received or your policy has been issued. Cover starts immediately on completion of your application subject to the qualification periods for certain benefits which can be checked on the Schedule of Benefits. This insurance is arranged by Compass Underwriting Limited and is underwritten by Lloyd’s Syndicate 4444 which is managed by Canopius Managing Agents Limited. Compass Underwriting Limited aim to pay your claim within 5 working days of approval. If you have another insurance policy in force at the time of a valid claim, which covers you for the same loss or expense, Compass Underwriting Limited will still pay you the benefit, however they may seek to recover some or all of the costs from the other insurer. What happens if I take out the cover and then change my mind? You can cancel the policy within 14 days of the start date and we will refund any premium paid if no claim has been made. Following this, you may cancel the policy at any time in writing to UniteProtect, 39/51 Highgate Road, London NW5 1RT, by emailing customerservices@uniteprotect.com or by phone on 0343 178 1249 but we will not refund any premium paid. This cover is only available to UK residents aged 18-65. Sorry, something went wrong trying to process your information. Please check your details and try again. Health Cash Plan is available to those aged between 18 and 65. Or if you have incorrectly entered your date of birth use the drop down boxes to enter your correct date of birth.